In the United States, Lyndon LaRouche is widely dismissed as a wing-nut conspiracist — a guy who claims that Queen Elizabeth pushes drugs. But in Russia, LaRouchite ideology is taken seriously by high-ranking politicians and scholars, and is cross-pollinating with the ideas of Russian far rightists such as Aleksandr Dugin. The LaRouchites’ wing-nut reputation actually masks a lot of their more dangerous politics and history. LaRouche, a former Trotskyist, founded the National Caucus of Labor Committees (NCLC) in 1969 as a Marxist organization, but in the 1970s transformed it into a fascist political cult with a unique ideology centered on grandiose, arcane conspiracy theories. By the 1980s, LaRouche’s followers had built an extensive network of organizations on several continents, dedicated to propaganda, fundraising, intelligence gathering, and political dirty tricks. (For details, see Dennis King’s 1989 book, Lyndon LaRouche and the New American Fascism, which is accessible online.) 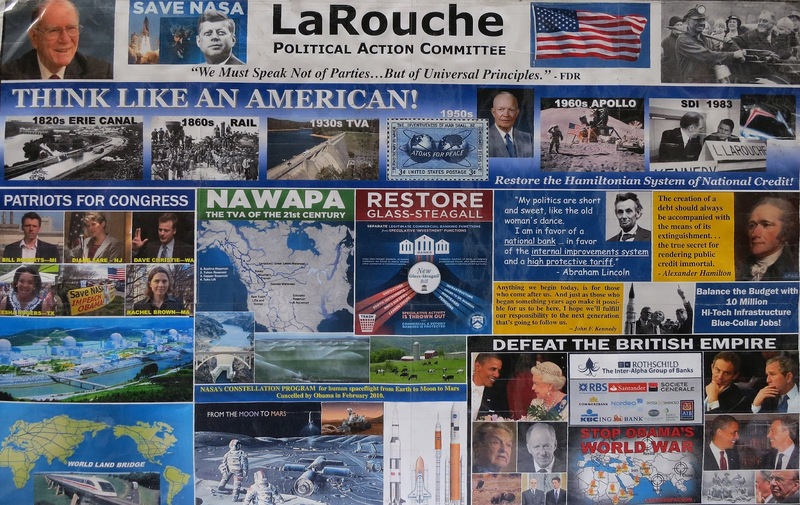 For several years, the LaRouchites had a friendly relationship with the Reagan administration and its security services, but illegal fundraising eventually got them in trouble, and LaRouche himself went to prison for fraud and conspiracy from 1989 to 1994. However, his organization rebounded by shifting to more “leftist” positions, with an emphasis on opposing U.S. military interventionism and international finance capital. Having lost the U.S. government connections they enjoyed in the 1980s, the LaRouchites worked to expand their ties with political elites in other countries — above all, Russia. In recent years, the LaRouchites have increasingly emphasized the importance of Russia on the world stage, and have largely aligned themselves with President Vladimir Putin’s international policies, for example on the conflicts in Syria and Ukraine. During the 1990s, LaRouche visited Russia and spoke at a number of academic meetings. His economic ideas sparked interest among some members of the elite who were unhappy with the laissez-faire policies that prevailed under then President Boris Yeltsin. Shekhovtsov’s article centers on LaRouche’s relationship with Sergey Glazyev, who in the early 1990s was minister of external economic relations (but resigned because of a disagreement with Yeltsin) and then a member of the State Duma, or parliament. Since 2012, Glazyev has been a prominent adviser to Russian President Vladimir Putin. kind of big infrastructure project the LaRouchites glorify. The LaRouchites like Putin not only because he has challenged the United States and European Union, but also because they see him as a kindred spirit on questions of national development. 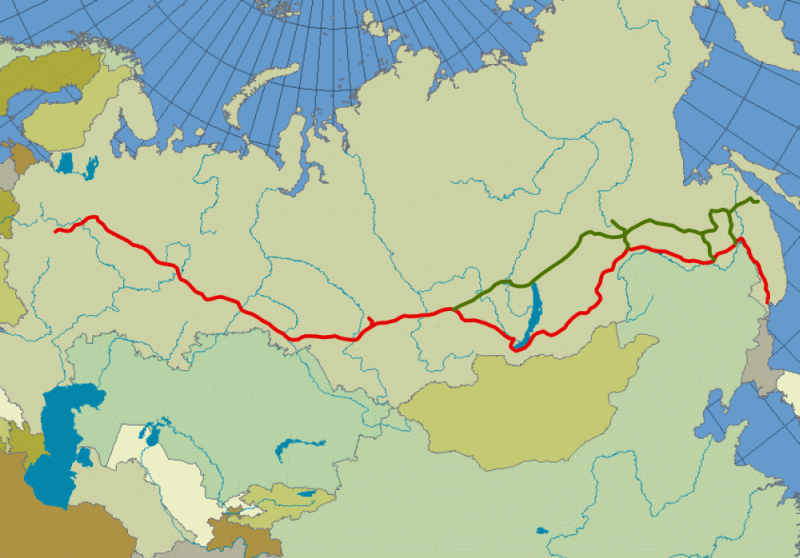 The LaRouchite program, for Russia and elsewhere, emphasizes a strong state role in society, classical culture and religion as the moral basis for politics, and big, high-tech infrastructure projects — notably a “Eurasian Land Bridge” transportation network — to drive economic recovery. Yet both LaRouche and Dugin offer a deeply authoritarian, culturally elitist vision of society, and a conspiracist critique of international elites, while claiming to reject racism and antisemitism. Hearing LaRouche demonize Britain as the center of the global oligarchic conspiracy, it’s not a big jump to Dugin’s view of history as a secret geopolitical contest between the good land power (Eurasists) and the evil sea power (Atlantists). And, above all, both LaRouche and Dugin see Russia as the key hope for humanity today. So it’s not a big surprise that Sergey Glazyev is on friendly terms with both the LaRouche network and Dugin. Glazyev participated in the founding conference of Dugin’s Eurasia Party in 2002 before helping to found a separate far right party, Rodina (Motherland), the following year. Glazyev and Dugin are both members of the Izborsky Club, an influential far right think tank that proclaims Peter the Great and Josef Stalin as the main heroes of Russian history. And one of Glazyev’s main jobs for Putin has been to negotiate greater economic integration of former Soviet republics under the rubric of a Eurasian Union — a project dear to both Dugin and LaRouche. These indirect ties between LaRouchites and Duginists in Russia are particularly striking given how politically isolated the LaRouchites are in the U.S. — even from other far rightists. This doesn’t mean the two movements are likely to join forces directly. Differences of ideology and political culture — not to mention their leaders’ egos — stand in the way of an actual alliance. But figures such as Glazyev and Vitrenko may serve as conduits — or “open channels” in the LaRouchites’ spy-novel terminology — that promote a sharing of ideas and information between the two. Glazyev and others in the political elite may also borrow ideological and programmatic elements from both movements to make something stronger. This is a level of influence most wing-nuts can only dream of. 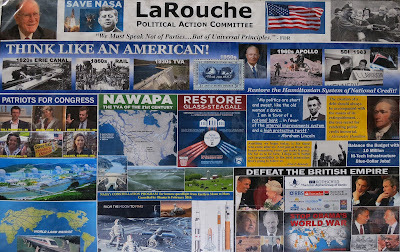 LaRouchePAC poster collage - By Racconish (Own work) [CC BY-SA 3.0], via Wikimedia Commons. Trans-Siberian Railway map - By User:Stefan Kühn (Own work) [GFDL, CC-BY-SA-3.0 or CC BY-SA 2.5-2.0-1.0], via Wikimedia Commons.